Homework-desk is one of the numerous custom writing services where one can get various types of assignment done. In order to be sure whether to trust this website you should evaluate certain features and factors that have a great influence on the customer’s satisfaction. We have investigated the most important sides of the cooperation with the customer and have prepared this Homework-desk review. Unlike other services that base their cooperation with the customers on the writing types, Homework-desk offers ordering a specific type of a document like an essay, multimedia project, multiple choice questions, lab report etc. The type of assignment needed will determine the price of your order and other specifications regarding the task. Help-desk has various terms of urgency, which you can set as a deadline. The shortest one is 3 hours and the longest is 10 days. The shorter your deadline is the higher the price of the order will appear. Note: The selection of services among the types of documents seems to be convenient but there are certain drawbacks at homework-desk.com. First of all, the order form is too confusing. There are a number of extra features and none of them is explained separately. Secondly, not all types of documents that the student may need are indicated in the list: does it mean that they are unable to complete them or that one should select a different type of document instead of the one needed? If it is so there is no sense of making the type of document as a central price factor. There are a number of factors that will influence the price that you pay for the work. For instance, the cost will depend on the type of document, paper’s urgency, number of questions, discipline, and various additional features. The prices for the services are quite higher than average. If you conduct a good investigation you will be able to find more fair prices. 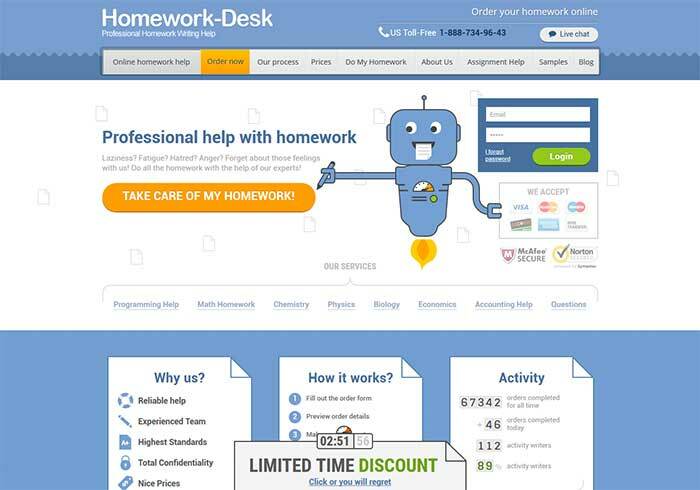 Unfortunately, it is hard to find a promo code of homework-desk anywhere at the website, therefore, it seems that the prices are not too flexible. We have decided to include in this Homework-desk.com review a section regarding the customer support. It is stated at the website that one of the biggest advantages of this service is 24/7 customer support, which means that you can use this service at any time despite the time zone of your location. There is an online chat at the website and the toll free number to call, however, we were unable to find out the email address of homework-desk.com. “No plagiarism” – this is, definitely, a worthy feature but why would one pay for a copy-pasted paper? “Perfect formatting” and “Thorough research”: these must be characteristics of a proper written paper and once you order it somewhere you should take them for granted. “PhD writers”: it would be nice to have your works written by high level specialists but will you be able to have a look at their PhD diploma? The personal details of the writers are not revealed, unfortunately, which means that one is not able to check any credentials of theirs.